KeWe8 (Kerber-Weinberger 8 ) is an obscure, low-surface brightness planetary nebula (PN) in the southern constellation of Puppis that is about 7 x 3.5� in apparent size at RA 07 33 25.00 and DEC -23 26 08.8 (J2000). It is also designated as G238.4-01.8. North is up and East is left in the above image. The field is about 29� x 29�. �It was listed in a survey of smaller planetary nebula interacting with the interstellar medium (ISM) by Kerber et al. (1998) as KeWe3� (http://aas.aanda.org/articles/aas/pdf/1998/12/ds1471.pdf). However, a SIMBAD search with these coordinates recognizes this as KeWe8 (KW8), so I will refer to it as KeWe8. It gives the appearance of two crescent-shaped, reddish arcs. This objects emits some OIII and H-a, but mostly NII by a large margin, which our 5 nm H-a + [NII] narrowband filter picks up.� A 30 minute OIII exposure failed to detect any� OIII emission signal. � The low ratio of H-a to NII suggests that this is an evolved PN, according to Kerber et al.� Near the bottom of the darker core is a diagonal pair of faint stars. 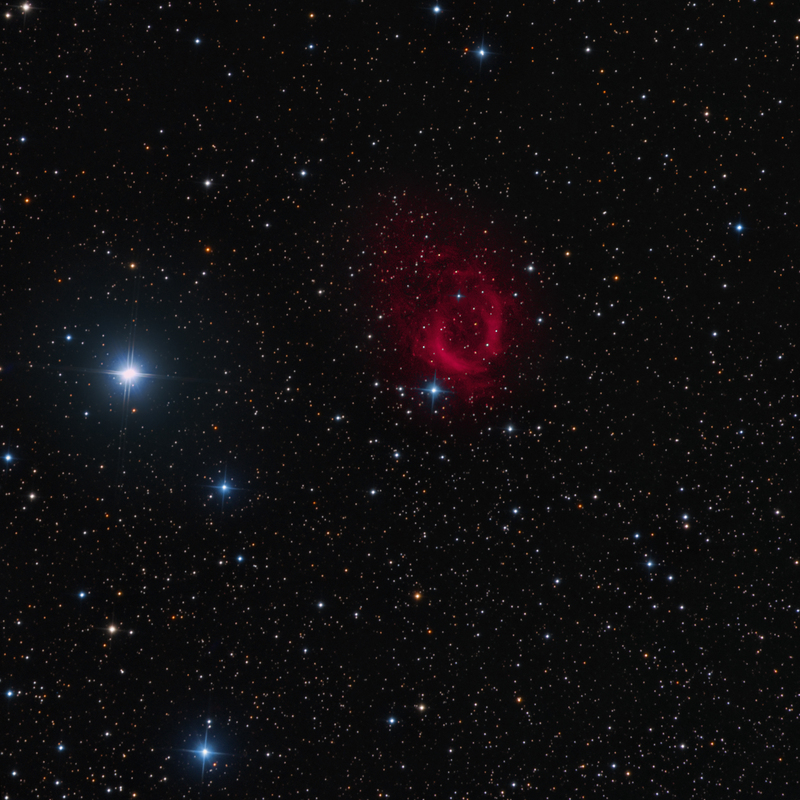 The central star of this PN is thought to be the left (brighter) of the two. There is an extended arc below (south) the bright crescents. There is also extended emission region toward the northeast with some structure. 8 hrs of 5 nm H-a + [NII] data for nebular detail were combined with 1.5 hrs of RGB data for star colors. This may be the only color image of this intriguing PN.� It is very faint.� The extended outer features around this planetary nebula were discovered in June 2015 by the Galactic Planetary Nebula Halo Survey team.